Image: Mark Leckey, The Universal Addressability of Dumb Things, installation view (detail) the Bluecoat, Liverpool 2013. Photo Jon Barraclough. Courtesy Nottingham Contemporary. Image: Richard Hughes, detail from Chapel Perilous, 2010. Courtesy the artist; Anton Kern Gallery, New York; the Modern Institute, Glasgow and Firstsite, Colchester. Pio Abad (born 1983, Manila, Philippines). Abad mines alternative or repressed historical events, and brings them together with particular aesthetic phenomena, in order to create artworks that operate across a range of registers. A work might investigate cultural events or personae, delving into their histories and drawing out associations between them and other moments, incidents or people. For example, Abad recently constructed an installation based on the figures of Ferdinand and Imelda Marcos, the first couple of the Philippines from the late 1960s to the mid-1980s, who were in power at the time of the artist’s birth. Through a series of works in various media including some of the Marcos’s personal effects, sculpture, painting, screen-printing and text, Abad explored their personal and political mythologies and through them, alluded to aspects of national and global politics from the 1980s to today. Abad’s work was included in the London Open, Whitechapel Art Gallery, 2012 and he was a finalist in the Converse/Dazed and Confused Emerging Artist Award, 2012. The Dairy Centre’s inaugural exhibition will be by Swiss artist John Armleder. His art is a celebration of reality in its everyday and most commonplace manifestations, and the exhibition will develop the multiple dimensions of his work through his intervention in both planning and setting up the exhibition route. Numerous pictorial works clarify how central the arbitrary is to Armleder’s ouevre, works made with neon lights revive the minimalist tradition of employing ready-made industrial materials, the multimedia installation in the Fridge will incorporate a variety of soundtracks and videos in an accumulation of audio-visual information without any hierarchical distinctions. Creating a bridge between Marcel Duchamp’s ready-mades and the Pop Art of Andy Warhol, Armleder’s work shuffles the cards and brings both historical precedents to a new level of understanding. Aaron Flint Jamison co-founded the artist-run center Department of Safety (2002-2010) in Anacortes, WA, USA. He is the founder and editor of Veneer Magazine. Jamison lives and works in Portland, OR, USA, where he is the co-founder of the art center Yale Union (YU). Recent exhibitions include Centre d’édition contemporaine, Geneva; Artspeak, Vancouver; Air de Paris, Paris (all 2012); and castillo/corrales, Paris (2011). Jamison is represented by Air de Paris. Tate Modern and Museo de Arte de Lima-MALI, one of Peru’s most important museums, have come together to curate a new exhibition as part of Project Space, Tate’s dedicated space for presenting emerging and recently established international artists. Re-thinking the traditional divide between historical monuments and discarded urban ruins, artists Rä di Martino, Pablo Hare, José Carlos Martinat, Haroon Mirza, Eliana Otta and Amalia Pica are brought together to explore contemporary ideas of archaeology, fiction and reality. Richard Hughes‘ sculpture and installations draw on the cast-off and dilapidated objects of the urban wasteland.Using a labour-intensive process of mould-making and casting, he produces meticulously crafted replicas of objects that are injected with an element of fantasy. His trompe l’oeil sculpture often produces a misleading impression of reality, bringing a sense of wonder and enchantment to the everyday. Produced in collaboration with Tramway, Glasgow, Time is over, time has come will span the building featuring newly commissioned sculptures and installations. Richard Hughes has had solo exhibitions at Tramway, Glasgow (2012); Sculpture Court, Tate Britain (2006); and The Showroom, London (2004). His work has been exhibited internationally, including presentations at the François Pinault Collection, Punta della Dogana, Venice; Carnegie Museum of Art, Pittsburgh and the Schirn Kunsthalle, Frankfurt. Hughes was selected for the fourth Liverpool Biennial in 2006 and the British Art Show 6 in 2005. He was nominated for the Beck’s Futures award in 2006 and was the recipient of the EAST International award in 2003. Katie Paterson has earned widespread acclaim for work that tackles some of the big questions about our place on earth. Her work often involves collaborating with leading scientists and researchers across the world. 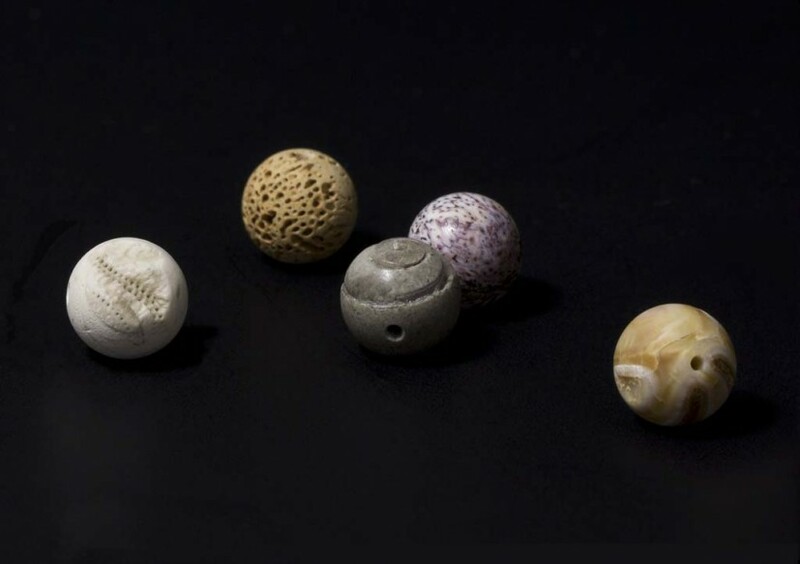 The exhibition brings together previous projects and new work.Inside this desert lies the tiniest grain of sand saw Paterson working with experts in nanotechnology to take a grain of sand and carve it to just 0.00005mm across – which she then buried deep within the Sahara desert. A photograph of Paterson standing amongst the dunes, features in the exhibition, a contemplation of the monumental elevating the minute. On display in St Peter’s Church is a new piece, Fossil Necklace, a culmination of her residency at the Wellcome Trust Sanger Institute. The necklace comprises over 150 beads carved from fossils that chart the evolution of life on earth. From a dinosaur tooth to a squid’s backbone, the oldest fossil is around 3.5 billion years old. Other works in the exhibition approach the themes of time and scale in different ways. As The World Turns is a record player moving imperceptibly slowly, in time with the rotation of the Earth. An ancient meteorite, fallen to earth and buried, is discovered and remade in Campo del Cielo, Field of Sky. The meteorite has been cast, melted then re-cast into a new version of itself that visitors can touch. The artist hopes to return it to space one day. Historical and contemporary works of art, videos, machines, archaeological artefacts and iconic objects, like the giant inflatable cartoon figure of Felix the Cat – the first image ever transmitted on TV – inhabit an “enchanted landscape” created in Nottingham Contemporary’s galleries, where objects seem to be communicating with each other and with us. Focal Point Gallery presents Video, Eddie Peake’s first UK regional solo exhibition, which is divided between the organisation’s main space and project room through site-specific material indicative of the artist’s burgeoning practice. New work includes a large sprayed wall painting, a marble sculpture of a Staffordshire Bull Terrier, and an invented structural form redolent of a Modernist zoo enclosure in the manner of Berthold Lubetkin’s Tecton buildings of the 1930s. The latter work is inhabited by a life-size giraffe and a moving-image work shot in the empty gallery space. Peake’s project is anything but a rumination on the perceived failure of Modernist architecture. Instead, it’s an elaborate puzzle or optimistic historical and ideological Russian doll that situates one form of Modernist architecture within another via a contemporary performative twist. When seen within the context of the soon-to-be-emptied Brutalist building that Focal Point Gallery and Southend Central Library currently occupy (both organisations will move to another structure in late 2013), Peake’s project is akin to the endearing vision of Tecton which, much like the collection of animals in a zoo, or the archive of books in a library, somehow continues to survive against all external forces.